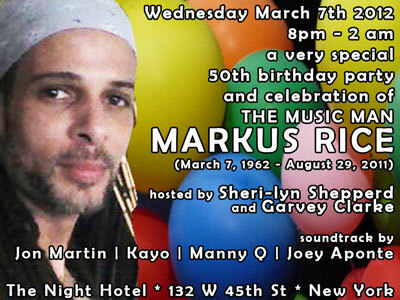 Friends of the late DJ, promoter, host and broadcaster Markus Rice present a memorial 50th birthday celebration in his honor on Wednesday, March 7th in the lounge of the luxurious Night Hotel. The event will be hosted by Sheri-lyn Shepperd and Garvey Clarke, with music b…y Manny Q, Jon Martin, Kayo and Joey Aponte. Friends, fans and family are welcome as we celebrate the life of our comrade in music. We know Markus will be there in spirit and would have wanted us to celebrate his life by bringing his favorite people together and enjoying some of his favorite tunes. We hope you’ll join us!